The Dynasty of Omri & Parallels: 885–841 B.C. | . . . . | . . . . | . . . . | . . . . | . . . . | . . . . | . . . . | . . . . | . . . . | . 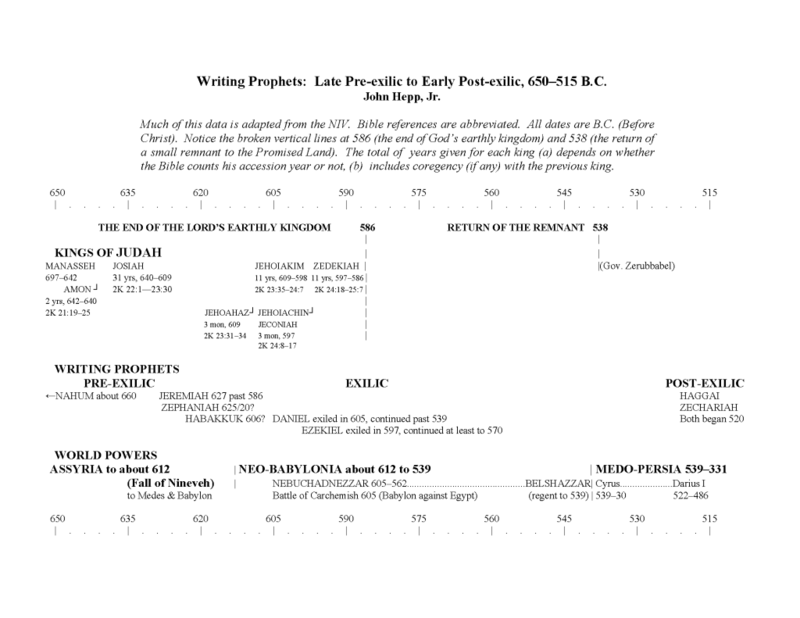 MAIN PROPHETS E L I J A H from near 870 until 848 or later. Then replaced by E L I S H A until at least 798.
remaining heirs except Joash and ruled seven years. 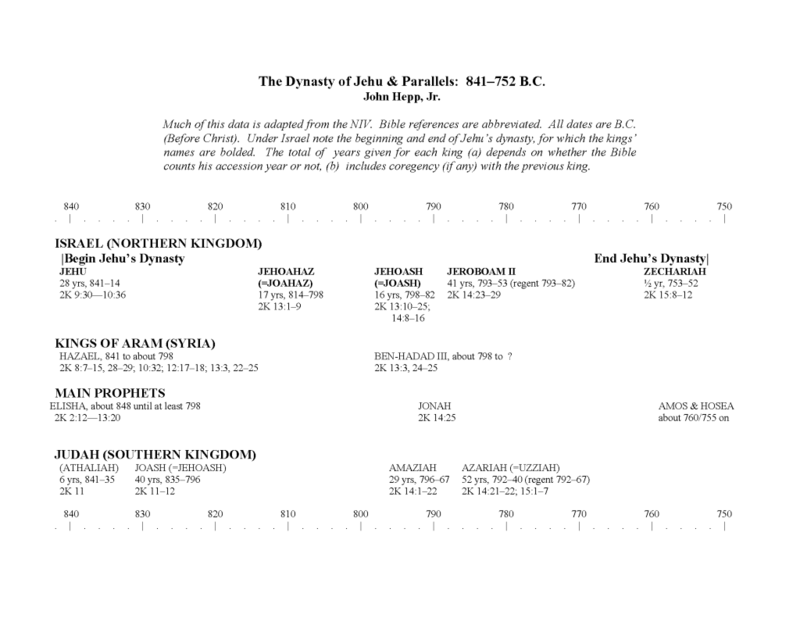 The Dynasty of Jehu & Parallels: 841–752 B.C. Student should fill out this page. Much of this data is adapted from the NIV. Bible references are abbreviated. All dates are B.C. (Before Christ). 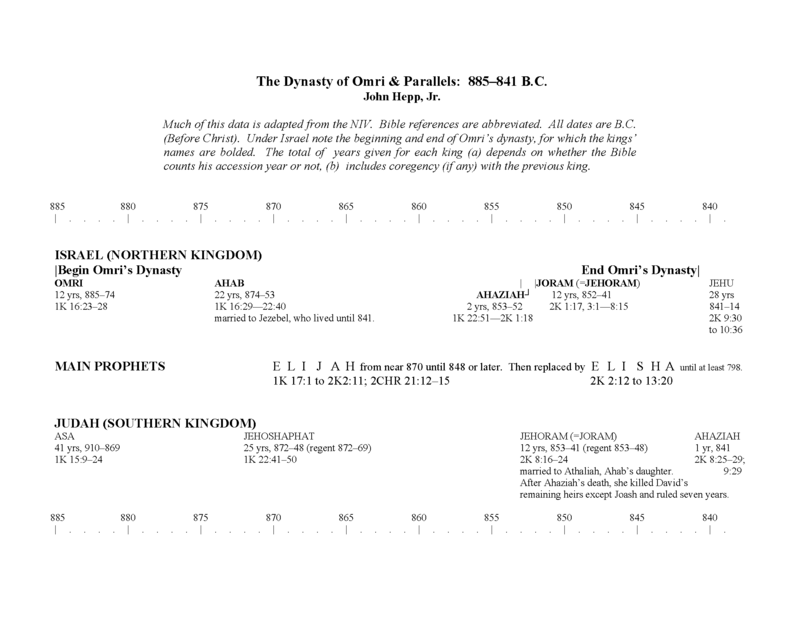 Under Israel note the beginning and end of Jehu’s dynasty, for which the kings’ names are bolded. The total of years given for each king (a) depends on whether the Bible counts his accession year or not, (b) includes coregency (if any) with the previous king. HAZAEL, 841 to about 798 BEN-HADAD III, about 798 to ? 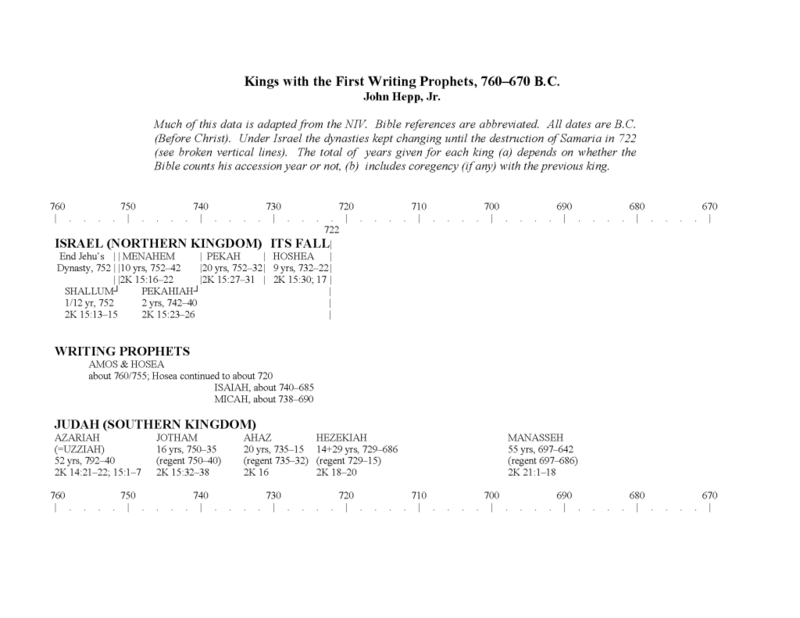 Kings with the First Writing Prophets, 760–670 B.C. Much of this data is adapted from the NIV. Bible references are abbreviated. All dates are B.C. (Before Christ). Under Israel the dynasties kept changing until the destruction of Samaria in 722 (see broken vertical lines). 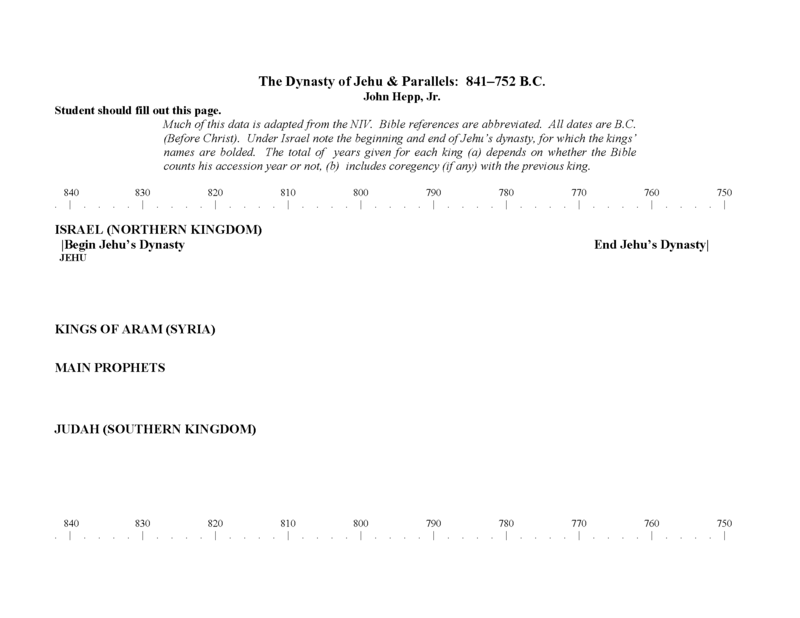 The total of years given for each king (a) depends on whether the Bible counts his accession year or not, (b) includes coregency (if any) with the previous king. 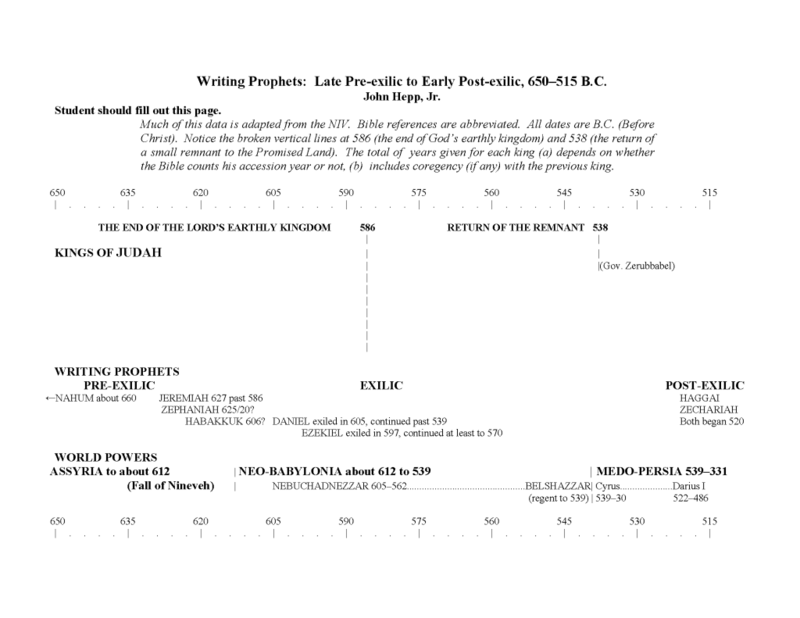 Writing Prophets: Late Pre-exilic to Early Post-exilic, 650–515 B.C. Much of this data is adapted from the NIV. Bible references are abbreviated. All dates are B.C. (Before Christ). Notice the broken vertical lines at 586 (the end of God’s earthly kingdom) and 538 (the return of a small remnant to the Promised Land). 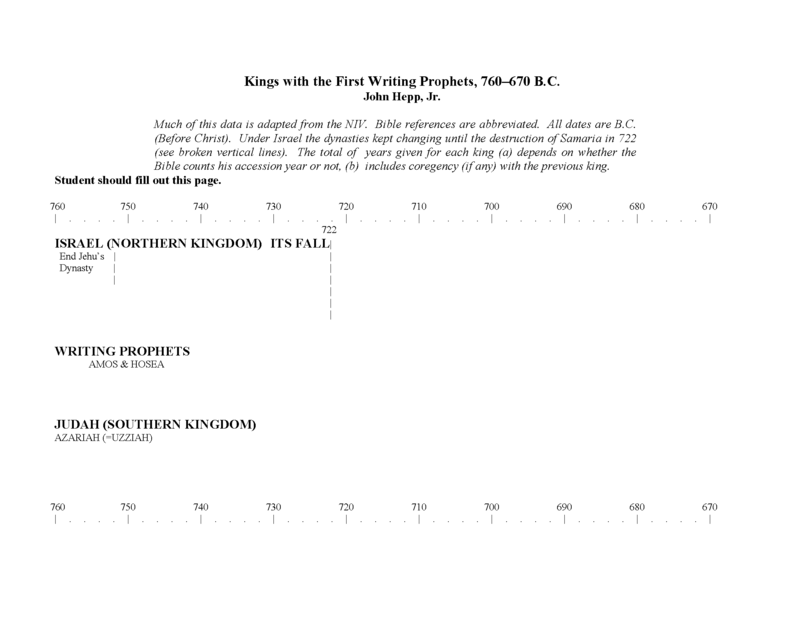 The total of years given for each king (a) depends on whether the Bible counts his accession year or not, (b) includes coregency (if any) with the previous king.